Camping Abri de Camargue campsite is a pleasant family friendly campsite which lies in the perfect place for exploring the beauty and wonders of the Camargue. The campsite is set within 4 hectares of beautifully landscaped grounds with a variety of vegetation offering plenty of shade and also separating the pitches to ensure you have your own space and privacy. Modern facilities at Camping Abri de Camargue ensure you have everything you could possibly need for a pleasant family holiday. 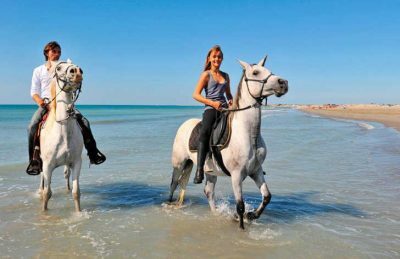 The Camargue area is well known for its natural beauty, wildlife and landscape. A third of the area is made up of either lakeland or marshland making it the largest river delta in western Europe. The Camargue is also home to over 400 different species of birds making it the ideal place for nature lovers to holiday. The nearest beach to the campsite is only around 1km away at Le Grau-du-Roi. Here you’ll find in excess of 12km of soft sandy beaches where you can sit back and relax whilst you’re children have fun swimming or playing in the sand. There are also a variety of water sports available at the beach. Although the beach is fairly close by, you’ll be pleased to know that the swimming pool complex at Camping Abri de Camargue is excellent. There are three pools in total, a heated indoor pool and an outdoor larger pool and a paddling pool for smaller children. Camping Abri de Camargue campsite offers a comprehensive selection of activities and facilities on site and also nearby to ensure you have a fantastic family holiday. On site activities at Camping Abri de Camargue campsite include a multi sports area, football, basketball, playground, table tennis, boules and cycle hire. Facilities available at Camping Abri de Camargue campsite include WIFI, restaurant, snack bar, takeaway, bar, groceries, animation team, games room, washers and dryers. Accommodation at Camping Abri de Camargue campsite includes a range of 2 bedroom mobile homes and tents that are available from Canvas Holidays .